In 1990 a loaf of bread cost only 70 cents, while a pound of hamburger was just 89 cents. Those days are long gone, but you can still eat well without spending a fortune with these helpful tips. If you don't bring lunch to work or you've had a long, tiring day, fast food becomes an easy solution. Avoid temptation by setting aside time during the weekend or your day off to plan the week's meals. Save more time and money by preparing meals and freezing them so all you need to do is reheat. Planning ahead allows you to make better use of products you already have on hand. Think outside the box and repurpose leftovers to add some variety. How many times have you stumbled across ingredients or leftovers that are long past the expiration date? When you unpack groceries, rotate products to bring older items to the front. Use masking tape and a Sharpie to label leftovers by content and date. If you are fortunate enough to have access to a farmers' market, get in the habit of shopping later in the day when you may be able to get some great deals from vendors who don't want to pack everything up. Another way to save money on produce is buying frozen fruits and vegetables. They're usually less expensive than fresh produce, and they're frozen at their peak ripeness so they're high in nutritional value. Convenience always comes at a price. Prepackaged salads and pre-cut veggies save time, but it's not worth the added cost. When you're chopping vegetables, cut more than you need and freeze the extras for future use. Of course, you don't have to limit yourself to Monday. The main idea is to have at least one day per week where you abstain from meat. You can make a wide variety of tasty and filling meals using beans, quinoa, tofu, lentils, eggs and other non-meat proteins. Do you think slow cookers are only for chili and stew? You may be surprised to learn you can make ribs, lasagna, stuffed peppers and other hearty meals, many with only a handful of ingredients such as these recipes. Another benefit is that you can start the meal in the morning and it's ready to eat when you get home. Spices are great ways to liven up meals, but they may go to waste because you don't use them often enough. Bulk spices let you buy smaller amounts and save money on unnecessary packaging. 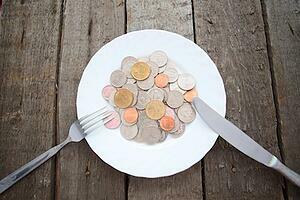 Have you discovered a clever way to eat well while saving money? Let us know in the comments!